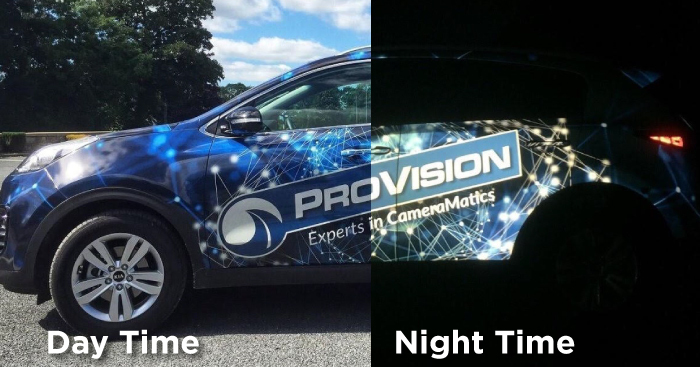 Add a night shift to the visibility of your graphics and never miss another impression with IllumiNITE Wrap™. As a premium digitally printable reflective film featuring FLITE Technology™, installers will experience an effortless installation when wrapping gentle curves and complex corners. The exceptional repositionability from FLITE Technology will alleviate bruising or chatter lines resulting in optimal reflectivity. Combine with Series 3220 overlaminate to protect and enhance your graphic. Superior repositionability and minimizing bruising for optimal reflectivity. Fast installation with Flite Technology. Brilliant graphics by day and luminous graphics by night. Most efficient removal in its class. *Image courtesy of Universal Graphics.